The film won the New Face Award at the 19th Japan Media Arts Festival (2015). Taifuu no Noruda is licensed in the US by Sentai Filmworks as Typhoon Noruda. At the time I'm writing this, 366 people have taken the time to rate this anime, but none have written a review. So I might as well be the first. First, I'd like to point out that this is a short animation, lasting only 30 minutes. As such, it's fair to say you can completely ignore the review and just watch this OVA yourself, as no reviewer can be a better judge of what pleases you than yourself! As at worst you'll only have "wasted" half an hour of your life. However, if for some obscure reason you still prefer to read the review first, carry on. I'll begin with what impressed me most, the art. It's reminiscent of the works of my favorite anime director, Makoto Shinkai. The backgrounds are drawn with much more detail than the characters, creating a sort of contrast. While the backgrounds in Taifuu no Noruda don't quite have the absurd level of detail found in Shinkai's works, they are still impressive. Other than that, I was also impressed by the feeling of impending doom the incoming typhoon managed to convey. The art direction here is definitely great. Sadly, the story is not up to par. It involves a mysterious girl that appears during the typhoon and is rescued by the main character. At the end of the show, her origins are still not explained, and we know just as much about who is she is as when the story began (that is, nothing). The story also involves a conflict between the main character and his best friend, which is resolved at the end in a rather clichéd way. Also cliché is the impossibly ridiculous way in which the protagonist saves the mystery girl from her impending doom. But oh well, this is anime, and concessions have to be made. One could argue that the 30-minute duration puts heavy constraints on the way the story can be told. While I agree, there are also other anime who managed to tell a good story in the same timespan (the excellent Harmonie (also referred to as Anime Mirai 2014) comes to mind). I feel like this one, however, would need two or three times its current length to be told in a satisfactory manner. The characters are likeable and have potential, but again, there was not enough time to flesh them out and cause me to get attached to them. If you don't care about having a fully realized story, then by all means watch this OVA. The art alone should be worth the half hour you invest into it. Besides, I can think of far worse ways to spend half an hour. Taifuu no Noruda is the result of attempting to squeeze a movie into half an hour. A lot of things are poorly explained if at all. The storyline is incredibly predictable, mostly because the characters are flat and cliche. The art was decent, nothing special, especially when compared to modern standards. The background music wasn't bad, but the voice actors sounded flat and boring. This is especially noticeable during exclamations; the characters do not sound scared or excited at all. The characters as stated before are incredibly cliche. The main character for the sake of wanting to make his own decisions decides to risk his life to save a girl, Noruda. He fights with his friend because he thinks it is lame to follow him. Characters are not the strongest point in this movie. In fact, Noruda's name is pretty much the only piece of information we learn about her. Nothing is explained about what she is, where she came from, and why she's causing the end of the world. I personally didn't enjoy it at all and would not recommend it. Not gonna go in-depth as this is only a half hour film. Well, for this particular film, Ishida and Arai decided to flip their roles of Director and Animator. Arai had been an animator for the late Studio Ghibli, now being quite involved with Studio Colorido, he makes his directorial debut with Taifuu no Noruda. 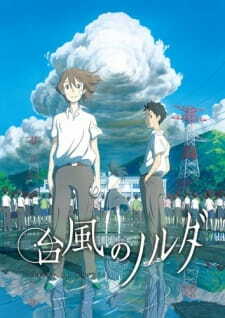 The film takes place on a certain isolated island, at a certain middle school, and on the eve of the culture festival. A boy quits baseball after playing his whole life and has a fight with his best friend. Then, they suddenly meet a mysterious, red-eyed girl named Noruda, and a huge typhoon hits the middle school. This is the longest film they have made running 27 mins. It leaves something to be desired for it's typical approach to narrative rather than relying on subtext through their superb visuals. Not to say the animation isn't good, in fact it's really good, but I feel like they are conforming to more recent character designs instead of the their previous works' style that is reminiscent to the more unique Ghibli characters. It's sort of a mash of the two. The only aspect that's underwhelming is the approach to its story. As typical of most Narrative focused short films, there is just too much of an idea squeezed into an insufficient amount of time, in both production and in the film itself. The story is too complex, forcing characters to develop prematurely and leaving lots of aspects unresolved. The voice acting also could have used a little more work, the characters didn't feel like they had any emotion, farther detaching the viewer from the story. As I mentioned, it was very well animated and an interesting idea even though events are rather cliche. Has potential to be a decent series if fleshed out properly. Still quite enjoyable. 6/10 (Note that I rate Short Films on a bit of a curve different to that of a series or full length feature film) I'll still be following and supporting Studio Colorido. I think I'll end up ordering the BD if available. And I hope to see a full length feature film or maybe an original single cour series in the future. And when they do, I hope Ishida retakes his rein as director and Arai returns to the drawing board. I won't lie. I was lured in by the art and it'd only take 27 minutes to watch it anyway, so I might as well. It seemed to have potential, but the rating said otherwise. The story seems interesting enough for a movie. Sadly, it was poorly executed. You get way too little information, you have no real idea what moves the characters and the ending fails to satisfy. It certainly left a bad aftertaste. Ironically, though, it didn't fail to get the point across. You get what it's about and how it's resolved. If it would have had more time, this could have been so much better. This is, for sure, the best this anime has to offer. The backgrounds are nicely drawn, have a great amount of detail and are just pleasing to look at. The characters lack detail - I'd even say the clothing looks kinda odd at times - which adds a certain contrast instead of looking bad. We've seen this style before, though, so it's not like it's anything surprisingly new and refreshing. However, if you came for the art, this won't disappoint you. I'm torn here. The music was nice, the voice acting, however, wasn't. The characters spoke way too dull and didn't get their feelings across at all. This could have been done a lot better. Sadly, this only adds to the way the characters came across. Dull. As I said, the voice acting supported this. The characters didn't have much of a personality - granted, it's hard to add that in the short duration this anime had - they just seemed horribly flat and mediocre. Especially Noruda lacks a lot of substance, in my opinion. I didn't hate it. I got what it's about, I got what's going on and it was nice to look at. Especially some scenes at the end were nicely executed. However, it wasn't great either. It just failed in a lot of ways and never got the level it could have been. I'm sure that, if this was 90 minutes or more, it would have been so much better. Overall, it felt mediocre. 5/10. However, it's not a horrible watch and if you got 27 minutes to spare, I'd still half-recommend watching it - it does let you imagine how it could have been and what they could have made out of it, so it doesn't quite feel like a waste of time - especially if you can appreciate the artwork.